Sounds like you have a warped drum(s) to me. I doubt Hal has a disc brake conversion! I have to agree with Brett on the drum issues. We have good drums in stock from a US manufacturer. $45 ea. I then jacked up the jeep and started looking at all the drums, they all appear to be good (I spun the wheels and watched the drums to see if they varied in diameter; crude but it worked). I spun the Driver's rear and had material fall out of the gap between the Backing plate and drum, also there was a dragging noise in the drum. 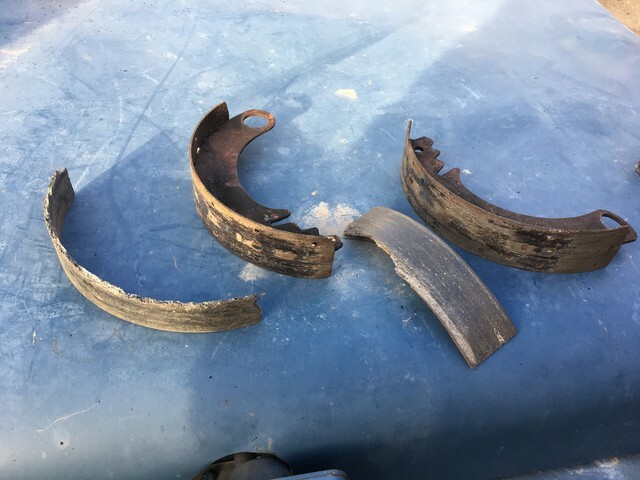 Took the wheel and drum off and found the brake shoes have totally disintegrated. The linings had completely come off the shoes and lodged in one spot. The drum was full of dust and debris. I removed the shoes and cleaned the area with a brush and canned air, then proceeded to install a new set of shoes. No more pumping of the brake pedal. I can again lock up all four wheels and stop on a dime as they say. It has to be a JPEG and it's file size must be reasonable (0 - 800K) and it must be hosted online already in your album here or elsewhere (must be public). This makes a good brake troubleshooting lesson. In all the shops I have worked in since the 1960's when a customer brought in a brake complaint we normally test drove it, then put her on the lift and pulled all four brake drums and properly inspected the entire system. Step one and step two every time! I do not see any rivet holes in the shoe material. Just me personally but with two flat surfaces like that I would not trust just glue to hold it together. As far as I know all the original, and every brake shoe I remember seeing has had rivets. I am sure Wes will chime in with a more informed view. That is a very good question. Can you inspect the backs of your pads to see if there are traces of rivets or rivet holes. They could have filled up with debris. If no rivets I’m sure we’d like to know who sourced those shoes.